Spring is upon us and forests throughout the Northern Michigan region are filling with the scent of wild leeks (also known as ramps). Almost any wooded property will have wild leeks, and spotting them is easy: Just look for the first green foliage on the forest floor after the snow melts until late May or early June. Both the greens and bulbs are edible. Leeks grow in clusters that originate from a single growing point under the ground. But don’t be greedy and dig up the whole cluster with a shovel. Pick two or three leeks farthest out on the cluster, reaching in with a finger to snap the individual leeks off horizontally rather than yanking them out of the ground. This method leaves the growing point intact to produce again next year. *Know that leek foraging isn’t permitted in the Sleeping Bear Dunes National Lakeshore and another note of caution: Do not search for leeks on open dunes and open meadows, because there is a poisonous plant called the Death Camas that resembles leeks and grows in those environments. A key thing to know: leeks smell like onions; death camas do not. 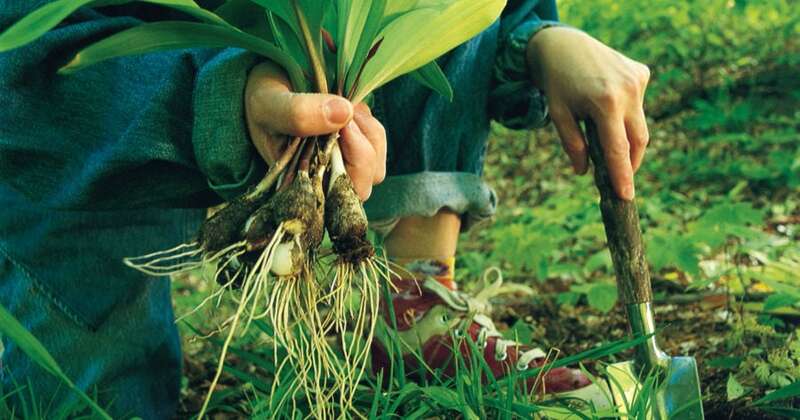 Rather than digging up the entire leek, snap off the bulb just above its base, leaving the very bottom of the bulb, the roots and any rhizome material in the ground. Don’t harvest an entire clump. Instead, just take two or three. Cut off the root tip if there is one, pull off the dirtiest outer layers and wash.
Slice and saute them in butter, pack in plastic bags and freeze. When you’re ready to use them, simply pull them out of the freezer and let the butter remelt in a skillet. Chop cleaned leeks into half-inch lengths. Place them on cookie sheets and put them in the oven at 170 degrees for about six hours or until they are dry. Store in plastic bags or clean, dry jars. Best used in soups and stews. How to Get Kids Hiking in Northern Michigan? Berry Foraging!